After sending out an email newsletter promoting an event, have you been noticing a lower click through rate and social media shares, compared to the previous campaign? In order to write high-converting emails, you have to focus what you want each element such as the subject line, the content and the call-to-action TO DO. Decide on what you want each email element to do before proceeding with the campaign. That way, you’re not muddying the campaign’s intent and confusing your customers. The subject line has only ONE JOB: to sell people on opening & reading your email. The goal is to get people to actually open the email to READ more about your event, product or service. Keep the subject lines short (around 10 words, if possible) and compelling by letting audiences know right away what the email is about. If the subject line is too long, it will get cut off when prospective attendees view the email on mobile. If it’s about a gala fundraiser, mention the fundraiser in the subject line. If it’s about a networking event with prizes, mention that. Avoid putting your call-to-action in your subject line such as Call now, buy now, click here or act fast, Using terms like these in your subject line along with words such as ‘purchase’, ‘free’, ‘discount’, ‘best’, ‘guarantee’ or ‘urgent’ will turn off prospective customers because they feel like they’re being pushed to buy and many of these words will also cause your campaign to go directly into the Junk Mail folder. Make sure you also A/B test your email subject lines before sending out the actual campaign to see which version of your subject line is more popular with your contact list. Audiences respond best to engaging, interactive content. Incorporate images, videos, infographics and slideshows into your content where appropriate to help promote events, services and new initiatives. Make sure you diversify the content too, sending a mix of visual graphics and original/curated content to keep things interesting. Also, personalize your e-newsletters by making sure to include the name of the person you’re sending the email to, showing prospective customers that you know who they are and care about their attendance at your event. Don’t wait until the closing paragraph of your email campaign to display your CTA. Making your CTV stand out with a button, bright colors and placing it in more than one location in your e-newsletter will make it easy for subscribers to purchase tickets, download an e-book or donate funds to your cause. Make sure your CTAs are also direct and to the point on what you want subscribers to do and make sure you focus on ONE action. Adding CTAs that tell customers to do more than one action will confuse them and dilute its effectiveness. Subscribe here for more information on email marketing templates, content marketing and public relations! Whether you realize it or not, there’s definitely industry sectors out there that are easier to create great marketing content for. You probably don’t have to wrack your brain to write a great brochure about promoting a resort in the Bahamas or develop an online contest to market your restaurant’s grand opening or sell your new line of clothing. Let’s face it, the tourism/travel, food/beverage, film/entertainment and fashion/beauty industries are generally pretty easy to generate buzz for, get fans excited about and create some awesome content for. Just photos of great events & locations can be enough to get fans buzzing about the latest developments. But unfortunately, not every industry has that luxury. Have you ever had to create a marketing campaign for accounting software? How about for soap or maybe even a pharmaceutical company? Ever felt stuck doing that and wanting to pull your hair out? Well, I’ve got some examples that might be able to pull you out of that marketing funk. From soap to file storage and customer service, here’s 16 companies in so called “boring” industries, doing marketing right. Take soap, for example. It’s pretty plebeian, right? You use it to keep clean on a daily basis and more often than not, I’m sure you purchased a certain one based on price rather than any other attribute. With over 40 different brands, it’s a product that’s more about daily utility, rather than actual consumer interest. But, there ARE a few brands that make marketing for soap/body wash exciting. Take Dove’s Real Beauty campaign, for example. From deodorant to body wash and everything in between, the brand has done an amazing job of emphasizing that every woman, no matter the ethnicity, age or body type is truly beautiful. The campaign has expanded from TV ads to billboards and online videos, with 2013’s ‘Real Beauty Sketches’-where women describe their appearances to a forensic sketch artist-one of the most watched ads of all time. Why does it work? Maybe it’s because instead of focusing on positioning themselves against the competition and coming up with a USP, Dove instead chooses to focus on how they can empower their consumers through subverting what advertising traditionally tells us is beautiful and focus on accepting ourselves just as we are. CRM tools to make life easier for online businesses? Yawn. It’s an absolute necessity to help businesses better manage contact lists, gauge campaigns stats and manage their presence on social media. But is it as fun and exciting as reading about the latest movie premieres @ TIFF? Probably not, but there are a few companies that are working hard to make CRM topics more interesting. Take Sprout Social, for example. One of the most comprehensive CRM when it comes to helping you leverage content on social media platforms like Facebook and Twitter, their blog does a great job of explaining all of their new features in layman’s terms and gives great advice on how to better use other platforms such as Google+. Cloud file storage and sharing products to make organizing and sending documents at work easier. Sounds like a sleeping pill, right? Even so, it’s a process for people to wait for your files to sync, upload and finish storing. There’s still a lot of people out there who may not understand the newer concept of cloud storage instead of using a USB drive or a CD. So cloud storage companies have their work cut out for them in trying to make their products sound user-friendly and fun at the same time. But there IS one company that’s doing a good job. 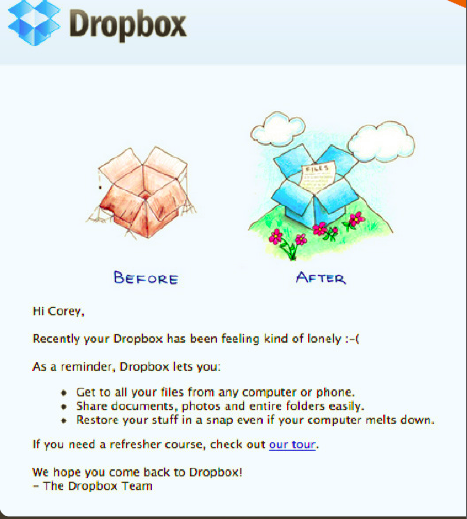 Dropbox’s email campaigns keep their messages short and snappy, they use great photos and they use language that has personality, which makes you want to interact with them. Who doesn’t love attending meetings at work? Even when you’re away travelling for work, you don’t ever have to miss a meeting in the office with convenient online meeting tools…..Doesn’t exactly roll off the tongue, does it? Meetings aren’t exactly peoples’ favorite thing to do, but there’s one company that does a pretty good job of making the most out of it. Check out GoToMeeting’s Twitter feed. They do a great job of taking a friendly professional approach to their content. They post everything from popular Internet memes to retweets and articles about the modern workplace. They make things interesting instead of focusing on their products all the time. They also share customer success stories which goes a long way to endearing clients to them. Vacuum cleaners and other cleaning supplies can be pretty boring huh? Almost every ad you see on TV shows the amazing cleaning powers of the vacuum or broom in question. From Dyson to Swiffer WetJet, all they seem to focus on is how it gets dirt off your floor. It’s definitely useful to know, but not very exciting. Take this heart-warming campaign from Hoover. 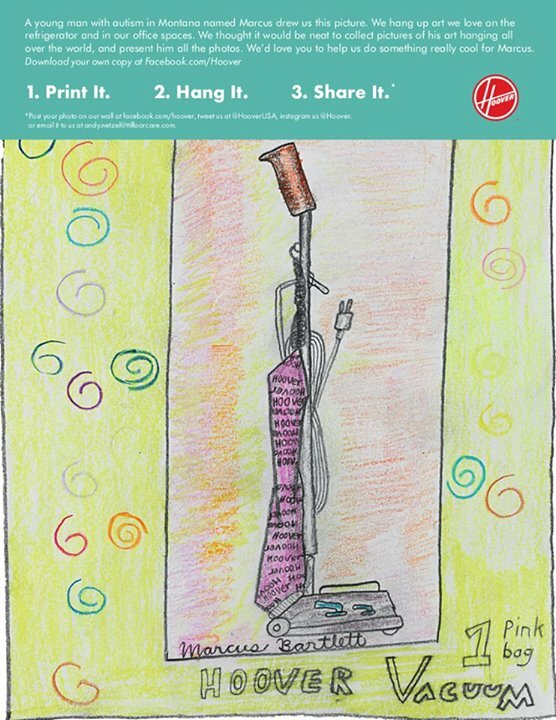 When they heard about a young man named Marcus who was autistic and had a special love for vacuums as he was always drawing them, they took his pictures and started displaying them around the office. Even better, they took his drawings and put it online for people to download, creating a mini-campaign in which Marcus’s love for vacuums could be spread to homes all over the world. Finding a new place to live, whether you’re renting or buying can be a huge headache. There’s a ton of listings to go through and open houses to attend AND a lot of questions that should be asked in order to determine if it’s the right place for you. After all, it IS the biggest investment you’ll ever make. The best companies try and make the experience more enjoyable. Memphis Invest did an entertaining video showing a typical property that a real estate investor would be looking at in the region. It has a Cribs-esque feel, complete with pop-up prices. It make touring through the property both informative and fun at the same time. Consulting is booming amongst baby boomers who retire from full-time work but aren’t quite ready to stop working. As of 2011, there were some 400,000 consultants in the US alone. Not all of them were sole proprietors either, some companies employ several consultants on their roster. Either way, that’s a lot of companies and a lot of people. With that many people out there with the title of consultant, how can companies differentiate? One great way to do so is through authoritative content, which one company uses to their advantage. Accenture does a great job of creating authoritative content in a number of different forms, from blog posts to podcasts and they’re also not afraid to bring pop-culture references into their content to make things more interesting and helps to turn industry content into something COOs and CMOs can use to help generate interest among their audiences. Having written academic papers myself on direct-to-consumer pharmaceutical advertising, I can see how it can be extremely boring to the average consumer. Everyone knows for example that probiotics are good for you, but how many people are actually interested in hearing an explanation on how they work? Many health topics are convoluted and hard for the general public to understand and the biggest content opportunity for that industry is to break it down into layman’s terms that everyone can understand and absorb. Vega, a plant-based nutritional supplement and health company does a great job of disseminating quality content that promotes healthy living through their social media channels and on their blog. They focus on inspirational stories on what inspires their consumers to get-and stay-active. Check out this great post on what inspired a consumer to start running. In a nutshell, marketing automation platforms allow you to streamline your marketing campaigns, scheduling tweets, managing workflows and automating follow-up emails. Are you falling asleep or switching to another website?! I get it, compared to other awesome aspects of marketing, marketing automation isn’t really considered to be ‘hot’, but it IS integral to improving everyone’s ability to create better marketing campaigns. Still, it sounds fairly bland and robotic compared to talking about the latest ad from Chrysler 300. There IS one company that’s spicing up the more boring aspects though. 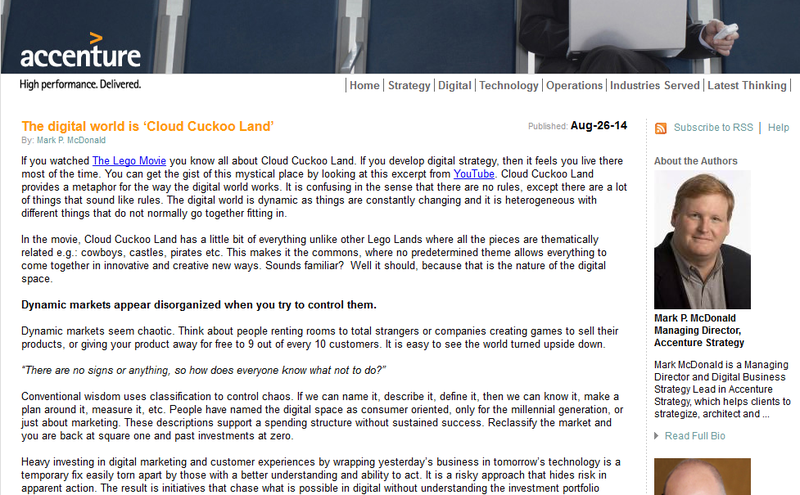 Eloqua has been creating an awesome content-rich blog for years, but where they particularly excel is at infographics. Their infographics are awesome because they make a point of adding value rather than just color and they do a good job of laying out statistics in such a way that everyone understands them. Everybody knows what a necessity insurance is in the modern age. The demand for information can be pretty high, whether it’s about health insurance or car insurance, but that doesn’t mean it isn’t boring. It’s an important part of personal and professional security, but that doesn’t mean we have to enjoy it. Luckily for us, there’s two insurance companies that are creating popular buzz-worthy content that definitely isn’t boring. Geico’s marketing campaigns with their mascots, the gecko and two offbeat guitar/ukulele players have been causing audiences to be in stitches for years. All-State has also been generating their fair share of laughs with the character of Mayhem, doing everything from streaking in a football field to running into the road like a deer in headlights. Most people cringe about calling customer service. They worry about having long wait times or dealing with customer service representatives that aren’t helpful. However, there are quite a few companies that don’t deal with customers this way that don’t get enough credit. That’s why awesome content can help the customer service rep and the customer, making their lives easier. Here’s one company that has recognized how exceptional content can help. ZenDesk offers customer service and support ticket software, but they do a good job of infusing the human element of customer service into their marketing. In one video, they sit two people next to each other, one ‘the business’, one ‘the customer’ that allows them to speak personally with one another, showcasing how ZenDesk can add real-world value into improving their relationship. Crutches can become a necessary evil when you have an injury that affects your mobility. Until you actually need them, it can be tough to figure out which ones you should buy or which ones work for you. A great company can provide content to help you decide if crutches are right for you. Goodbye Crutches provides free ground delivery for all of their alternatives to crutches. To make the process of choosing an alternative, they have a great quiz on their website that will help you find which crutch is the best for you, eliminating guesswork and making things easier for you! It’s a necessity that you use every day, but you don’t spend a lot of time thinking about which one to buy unless it’s about price. But when you do buy it, there’s a ton of options to choose from. You don’t generally think about toilet paper as having great marketing, but Charmin’s been doing an amazing job keeping their products top of mind with their TV spots and their Twitter feed. They’ve converted their Twitter account into a hilarious hub for humor, with #tweetfromtheseat, their most popular hashtag generating hilarious responses. They’re not afraid to even keep the conversation going and respond to even some of the more NSFW comments. Ah, radiology. The ability to take X-rays when you have an injury. Not exactly making you feel warm and fuzzy, is it? Especially since you only go there when you’re already dealing with an injury. Radiology, like the rest of the health industry, isn’t crystal clear, but there’s an organization out there that’s staying top of mind and making it a little easier to understand. 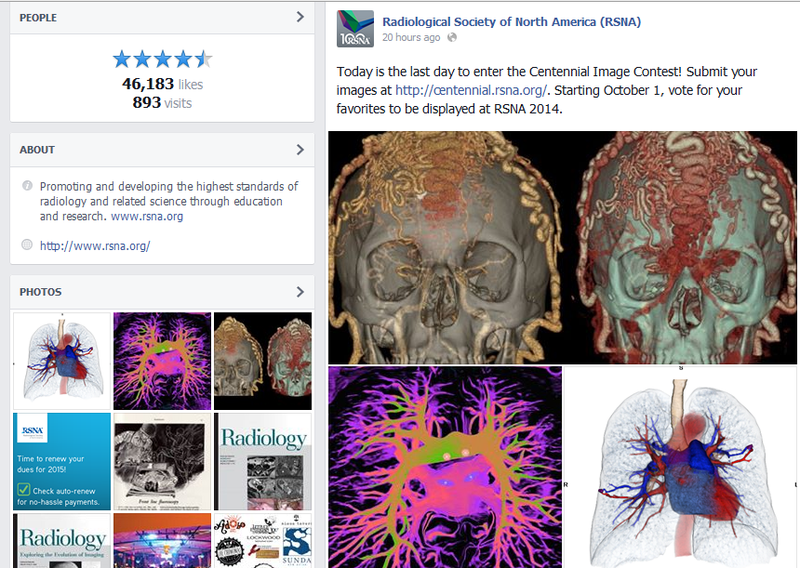 The Radiological Society of North America (RSNA) successfully uses their Facebook page to connect with their audience in a light and funny way. They even hold contests for the public to submit and then vote on their favorite X-ray images. You know what’s interesting? A multi-national conglomerate company that has their hands in every industry from consumer to industrial, finance to energy and technological infrastructure. Basically, your company does everything and yet how do you take everything and make it interesting? Check out GE’s Pinterest Page, it’s proof they don’t take themselves too seriously, with boards named #Badass Machines next to boards like #Brilliance in Motion. They even go so far as to incorporate the Ryan Gosling “Hey Girl” meme into a Pinterest board, but making it about Thomas Edison instead and hold a contest special board #GEInspiredMe to entice the public to post photos of how GE inspires them. People don’t typically turn to software companies for entertainment or educational content. But with the right mentality and the organization to keep great content always in the pipeline, software companies can gain recognition and spread the word by producing the right content for the right people at the right time. Marketo does a great job of creating top 5 and top 10 lists of marketing ideas and other aspects that are easy to read and follow. They also do a great job of creating videos that opens the dialogue between them and the customers, almost as if you really were having coffee with them and asking them questions, known as “Coffee with Marketo”. I hope that no matter what industry you’re in, these companies have inspired you to create awesome content and to not let the label of “boring” stop you. Keep checking back here for more awesome blog post on how to make the most of your marketing campaigns, including this post on how you can improve your calls-to-action (CTAs)!